Q.V. Phan, H.J. Kim, G. Rooh, S.H. Kim. Tl2ZrCl6 crystal: Efficient scintillator for X- and γ-ray spectroscopies. Journal of Alloys and Compounds, Volume 766, 25 October 2018, Pages 326-330. Radiation dosimetry is closely associated with the sustainable development of nuclear physics, nuclear technology, radiation technology and other related fields such as industry, agriculture, medicine, etc. Dosimetry methods and techniques are generally based on the evaluation of energy absorption in which radiation is directly transmitted to matter by increasing heat, or based on the estimation of energy absorption via secondary operations working together in matter like ionization, structural changes, chemical and biological reactions, discoloration of materials, etc. 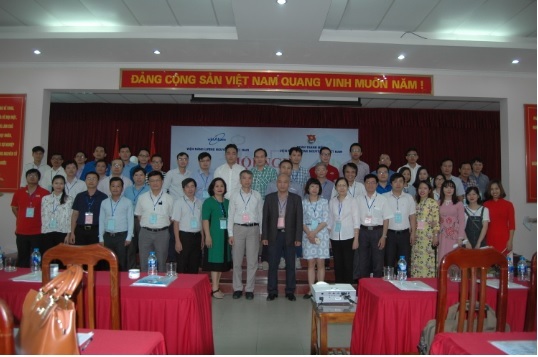 Within the framework of the cooperation program between the International Atomic Energy Agency (IAEA) and Vietnam Atomic Energy Institute (VINATOM), a workshop on establishing IAEA-VINATOM Collaborating Center for Environmental Studies in Vietnam took place in July 2018 in Hanoi, Vietnam. The workshop focused on guidance for the Collaborating Center construction in the field of nuclear and isotope technology applications in environmental and climate change-related research. Within the framework of the Cooperation Program for Nuclear Human Resource Development between Vietnam Atomic Energy Institute (VINATOM) and Japan Atomic Energy Agency (JAEA), the 10th VINATOM-JAEA Joint Training Course on Nuclear and Radiological Emergency Preparedness (NREP-10) was held from 1 to 5 October 2018 at Hanoi-NuTEC Center, Institute for Nuclear and Technology (INST).